Shatterstar #2 Review – AiPT! Shatterstar and Rictor come together again, but it’s not like old times. As a fan of superheroes, queer characters in comics, and (especially) queer superheroes in comics, I was very excited when Shatterstar’s solo miniseries was announced a few months ago. When it came to the actual first issue, I was pleased, but not ecstatically so. The creative team did a lot of work setting up Shatterstar’s new status quo and the series’ conflict, which was good. Unfortunately, there was a bit of an over-reliance on telling over showing, so it was difficult to feel fully invested in the series’ events. Does this month’s installment do better on that front? 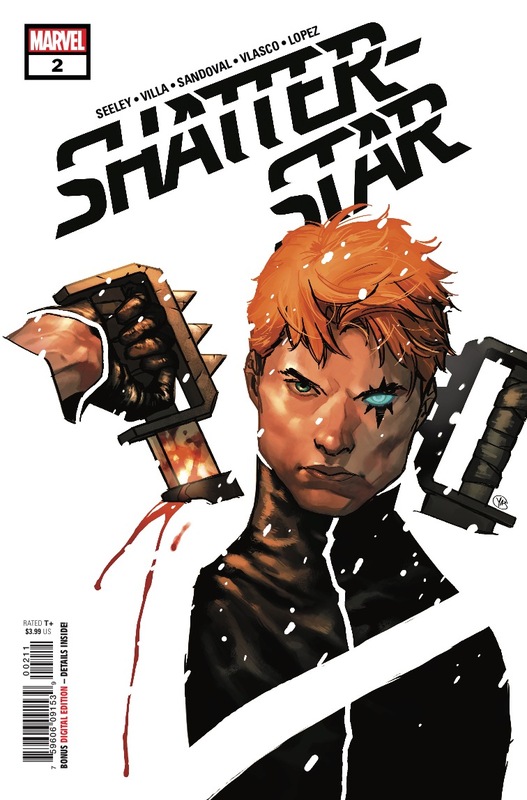 Is Shatterstar #2 good? This issue begins with a short snippet of the Grandmaster commenting on the gladiatorial combat he’s arranged on an alien planet. The events seem to be a mix of his usual gig and Mojo’s, as the combat is televised. A brief history of the planet’s natives is also provided. All in all, it’s good that the creators are providing context for the series’ main setting, but this scene doesn’t use its page-time effectively. Writer Tim Seeley delivers most of the information via dry narration that does nothing to make these aliens or their history notable compared to that of any other Marvel extraterrestrials. The whole thing is just too generic. Thankfully this doesn’t last long and things pick up when the plot shifts to Earth. Much of this issue revolves around ‘Star and Rictor, which is great. Seeley does a solid job on the dialogue, making it clear that the pair are very closely connected despite their current resentments with one another. The pair’s relationship is easily the most interesting part of the issue, so it’s disappointing that much of their history is referenced more through narrative captions than the events themselves. This problem isn’t as rampant as it was in the last issue, but it still weakens the emotional resonance of some moments. Seeley attempts to imbue the issue’s ending with poignancy by calling back to earlier captions, but this only does so much because we never actually get to see the events that are being referenced repeatedly. With that said, the solid pacing and joy of seeing ‘Star and Rictor together help make up for this. Art-wise, this issue is a mixed bag. The flashback sequences are easily the most visually appealing. Gerardo Sandoval’s line-work has a rough texture to it befitting ‘Star’s gladiator past, when his life was just one act of violence after another. The current day scenes are less consistently successful. Carlos Villa does the pencils and Juan Vlasco provides the inks, and their fundamentals are all solid. Villa shows premise when it comes to laying out an action scene, so hopefully future issues will provide opportunities for him to continue showing off his skill in that area. Unfortunately, some of the non-action scenes feel a bit static at times, partially due to stiff character poses. The coloration also falls a bit flat; it doesn’t do much to add any sense of texture or dynamism. There are some exceptions to this where the pages look fantastic, but it’s still an issue. Overall, Shatterstar #2 is an enjoyable but flawed issue. We get some solid interactions between ‘Star and Rictor, the flashbacks look fantastic, and there’s some added context for the conflict. Unfortunately much of that context is generic, as is much of the line-art and coloration. I’m excited for the next issue, but this month’s isn’t a must-read. A solid issue, but one that's held back by its narration and sometimes generic visuals.